We got some lovely arugula in our pick box last week and I enjoyed it in lots of different ways. It is perfect in a cheese sandwich with a thick slice of Cotswold cheese ( a Double Gloucester with chives) on whole wheat bread. Also in a salad, which explains the title of this post. I enjoy eating locally produced food. Especially vegetables that depend on freshness, like salads. I also enjoy it because it means I take notice of the local seasons, which in Florida means mangos in the summer and strawberries in the winter. 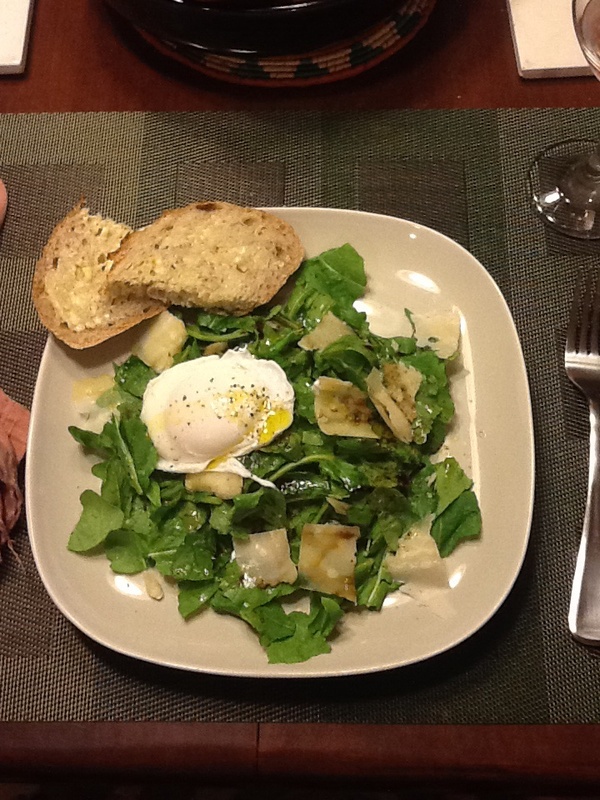 Arugula salad with poached egg, shaved Reggiano, and balsamic dressing. Back to that salad. The arugula was local, as was the lightly poached Lake Meadow egg broken on top which adds to the dressing as the yoke runs through the leaves. But the olive oil came all the way from Spain and Balsamic vinegar and Parmigiano Reggiano cheese from specific areas of Northern Italy. How to resolve this contradiction? I think that local is not the most important thing. There is some research (yeah, sorry. That is behind a firewall. If you are not a Rollins person, please don’t pay for it. Use your local library’s ILL service to get it sent to you) to indicate that local production can be less efficient and have a larger carbon footprint than more extensive systems of food distribution. As the authors conclude, “the concept of food miles, as typically used, is of little value per se and that it is the carbon emission per unit of produce over the transport chain that really matters.” But I would also add the carbon emissions and environmental impact of production, as well as transportation. So then, why buy local? I do it for the impact on our communities ( I like to have small farms producing interesting and flavorful food in the area and am prepared to pay more for the food they produce.) I like the variety of produce they make available, I like the seasonality of the food, and most of all I enjoy the flavor and freshness. But that doesn’t work all the time. When it comes to certain foods; wine, spirits, coffee, tea, cheese, olive oil, balsamic vinegar, and I am sure you can think of others, I am going to choose the one I prefer, wherever it comes from. There are some good cheeses in Florida, two reasonable whiskeys (here and here)and there is at least some olive oil. But the best of those products come from places that use the word “local” in another sense. Parmigiano Reggiano means Parma and Reggiano cheese. It is produced in those local areas, from the milk of cows grazing in those areas, and produced by skilled artisans who know their craft, with gee nations of experience to build on, and a local market with high expectations. The food reflects what the French call terroir. I enjoy eating in both senses of the word local.